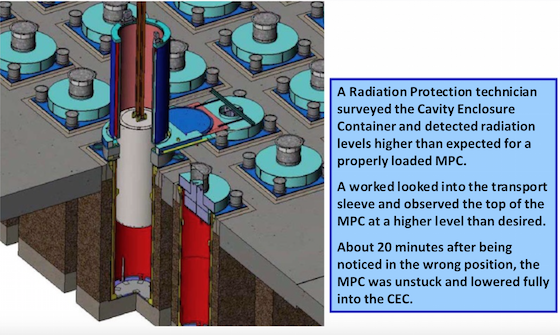 There was an incident in August at the San Onofre Nuclear Generating Station in which a canister filled with spent nuclear fuel got wedged into a storage cavity about 18 feet above the floor. While the incident did not pose a threat to the public or workers at the plant, which is undergoing the decommissioning process, it did raise a level of concern. Southern California Edison is now transferring 73 canisters of nuclear waste from “wet storage” to a newly constructed “dry storage” facility at San Onofre. The Aug. 3 incident with the wedged canister is the second in five months related to fuel transfer at the plant — and that concerns David Lochbaum of the Union of Concerned Scientists. A nuclear engineer, Lochbaum worked in the nuclear power industry for 17 years and spent one year at the Nuclear Regulatory Commission, the federal agency in charge of protecting public health and safety related to nuclear energy. Back in March, the fuel transfer was delayed 10 days after workers discovered a piece of shim — a pin 4 inches by a half-inch — came loose while a canister, designed by New Jersey-based Holtec International, was loaded at San Onofre. Edison received assurance from Holtec and an independent engineering firm the canister’s integrity was sound. Fully loaded, a canister weighs about 45 tons. After studying the Aug. 3 incident, Lochbaum concluded it was unlikely the wedged canister of irradiated fuel could have dropped 18 feet. The incident came to light after a man identifying himself as an industrial safety worker at the plant stood up during the public comment period at the quarterly Community Engagement Panel meeting earlier this month and described what happened Aug. 3. David Fritch said a canister being lowered into what is called a “cavity enclosure container” got stuck but two workers guiding the descent did not realize it. The Union-Tribune left multiple voicemails with Fritch but has not received a return call. Palmisano said “there is a very snug fit” as the canisters are lowered into the cavity enclosure containers and it’s not unusual for the loading team to make “a few adjustments” to get the canister in place properly. The enclosure containers are about 20 feet high and the canister got lodged on an inner ring that helps guide it into place. But the Holtec crew were unaware the canister was wedged. About 20 minutes later, an oversight team recognized the mistake and the canister was re-adjusted and successfully lowered to the bottom. Once inserted, the canisters rest largely underground in the cavity enclosures at the dry storage facility. The incident happened on a Friday and Palmisano said the following Monday Edison’s staff at the plant notified the NRC, and Palmisano decided to suspend subsequent transfers. “It’s an unacceptable incident,” Palmisano told the Union-Tribune but said the “very robust design” of the canister would have prevented any radiological leak — even if it had fallen 18 feet.